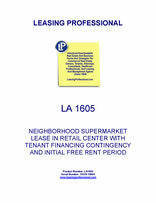 This pro-landlord lease is designed for a supermarket taking space in a neighborhood shopping center. The lease contains a financing contingency in favor of the tenant, and if the tenant is unsuccessful in obtaining satisfactory financing, it may terminate the lease. The form provides for minimum rent, percentage rent, and prorata payment of operating costs for the center, subject to pro-tenant limitations. Exhibits included: Work Letter, Landlord's Work, Sign Criteria, Guaranty. 1. PREMISES. Landlord does hereby lease to Tenant and Tenant hereby leases from Landlord that certain space (herein called "Premises"), containing approximately ______ square feet of floor area; ________ square feet on the ground level, _______ square feet in the basement, and _______ square feet on the second level, located at ______________. 2. LOCATION AND DIMENSIONS OF PREMISES. The location and dimensions of said Premises are delineated on Exhibit "A" attached hereto and incorporated by reference herein. Said Premises are located in the City of _______and County of _________, State of ___________. This Lease is subject to the terms, covenants and conditions herein set forth and the Tenant covenants as a material part of the consideration for the Lease to keep and perform each and all of said terms, covenants and conditions by it to be kept and performed. 3. USE. Tenant shall use the Premises for a grocery store, food prep and kitchen, delicatessen, cafe, floral shop and general offices, and shall not use or permit the Premises to be used for any other purpose without the prior written consent of Landlord. 4.A. I. Tenant shall pay to Landlord $________ as minimum rent for the Premises for the months of ___________, unless no minimum rent is to be paid as provided herein. Rent shall be payable on the _________ day of each month, commencing __________. No proration of rent shall be payable if the lease is executed prior to ___________. II. Tenant shall have the obligation, on or before _________, to obtain the financing contemplated in Section 4.B. below and to provide Landlord with written notice confirming such financing. Any such notice shall be deemed to be given, for purposes of calculating rent due and free-rent periods, effective as of the next succeeding twenty-first day of a month. (For example, if Tenant gives notice on _______ that financing has been obtained, Tenant's notice shall be deemed effective _________, and the six-months' free rent shall commence on __________ and full rent shall be next due on ___________.) Upon Tenant notifying Landlord that Tenant has obtained financing as contemplated in Section 4.B. below, Tenant shall build out and occupy the Premises for the following six-month period rent-free. Thereafter Tenant shall pay the rental rate as provided in Paragraph 4.A.III below. (c) Once Tenant's sales on the Premises for any consecutive 20-week period exceeds $_________, then Tenant's Minimum Rent, regardless of what Tenant’s Minimum Rent may be at that time, shall automatically increase for the remainder of the term of this Lease by $_________ per month. Tenant must deliver written notice to Landlord stating that financing has been obtained on or before ________ or this Lease shall automatically terminate, and Landlord may keep all monies paid by Tenant to Landlord as liquidated damages. If this Lease terminates as described above this Paragraph then Landlord waives the right to damages, including specific performance, other than the liquidated damages described above. Once Tenant has delivered written notice to Landlord stating that financing has been obtained then the financing contingency shall be deemed satisfied and Tenant shall no longer have any rights to terminate this Lease due to lack of financing. Rent for any period which is for less than one (1) month shall be a prorated portion of the monthly installment herein based upon a thirty (30) day month. Said rental shall be paid to Landlord, without deduction of offset, except as provided herein, in lawful money of the United States of America and at such place as Landlord may from time to time designate in writing. Notwithstanding anything to the contrary herein all payments are recognized to be payments as a gross lease payment amount per square foot as it relates to the total amount paid. During the first two (2) months Tenant shall seek financing sufficient, in Tenant's determination, to allow Tenant to finish the space for use as described herein for said location and deliver notice to Landlord that Tenant has obtained financing. Tenant shall use its best efforts to obtain said financing. Tenant shall be deemed to have used its best efforts if Tenant obtains and rejects financing which Tenant, in its good faith determination, feels is uneconomic given the terms of such financing. Minimum Rent shall change each year by the percentage change in the Consumer Price Index - All Urban Consumers, _________ Metropolitan Area All Item, ("CPI") for the twelve (12) months most recently reported by the U.S. Bureau of Labor Statistics over the CPI, for the prior twelve (12) months, but in no event more than four (4%) percent per year. Minimum Rent actually payable shall be adjusted once each two (2) years. Both Tenant and Landlord desire for Tenant to have hoods and vents in the location for the purpose of cooking food on site. Presently the zoning does not allow Tenant to cook food on site. Landlord shall diligently pursue all necessary approvals to allow on site cooking. Tenant shall fully cooperate with Landlord in any and all efforts Landlord may undertake, including a rezoning of the parcel, which Landlord might undertake for the purpose of allowing Tenant to cook on site. In the event that Landlord fails in its efforts to obtain a variance or a rezoning thus allowing Tenant to cook on site, then Landlord shall give Tenant a rental abatement of $_________ per year for a period of 5 years. Notwithstanding anything stated to the contrary herein, Tenant shall not be entitled to, nor shall Landlord give to Tenant any rental subsidy after the date which is 5 years from the date of Tenant’s grand opening or the date on which hoods and vents are allowed for on site cooking, whichever comes first. The abovementioned rental abatement shall not begin until Tenant opens for business. Said rental abatement shall reduce each month's Minimum Rent by $________, but only for the abovementioned rental abatement period. Regardless of how many years this rental abatement has or has not been in existence, if at any time during this Lease on site cooking is approved or allowed by any and all governmental authorities having jurisdiction thereof then the Minimum Rent abatement shall cease to exist from that day forward, however Tenant has no obligation to repay the previously abated monthly amounts. A. Primary Term. The primary term of this Lease shall be ten (10) full calendar years. The parties hereto acknowledge that certain obligations under various articles hereof may commence prior to the lease term, i.e. construction, hold harmless, liability insurance, etc. ; and the parties agree to be bound by these articles prior to commencement of the lease term. B. Option to Extend. The Tenant shall have three (3) five-year options to extend the term. Rent during each renewal shall be the market rate for comparable space in a comparable location. However, under no circumstances whatsoever shall the rent in any given year be less than the minimum rent in the preceding year, as adjusted by CPI pursuant to Section 4.C. above. Market shall be determined as follows: each side shall choose an appraiser; if the two appraisers cannot agree they will choose a third appraiser and all three appraisers will determine the market value of the space at that time. Notwithstanding anything to the contrary stated in this Paragraph, under no circumstances shall Tenant's rent ever increase by more than thirty (30%) percent of Tenant's Minimum rent in the preceding year. C. Termination Option. In the event that Tenant has no 20-week period during the first three years after the date Tenant opens for business in which the total sales for said 20 weeks is greater than $_____ Million, then Tenant shall have an option to terminate this Lease as follows. Tenant shall have 90 days after the third anniversary of the date Tenant opens for business in which to notify Landlord that it wishes to exercise its option to terminate this Lease. If Tenant does not give Landlord written notice of said intention to terminate this Lease within said 90 day period, then any and all options Tenant has to terminate this Lease under this clause shall cease to exist. If Tenant notifies Landlord it wishes to exercise this option to terminate this Lease, it must inform Landlord in said written notification the exact date on which this Lease will terminate. This termination date cannot be sooner than six (6) months from the date of notification not later than one (1) year from the date of notification. Notwithstanding the above in the event in any given 20 weeks in the first three years Tenant has gross sales of $____ Million or greater during any given said 20-week period, the option to terminate as described in this Paragraph 5.C., shall cease at that time. Notwithstanding the above, to exercise this option Tenant must deliver to Landlord $_______ in the form of a cashier's check or certified funds within 30 days after the date of notice of termination, otherwise this clause shall be null and void and Tenant shall have no options to terminate this Lease pursuant to this Paragraph 5.C., and the above notice of termination if already given shall be deemed invalid and void.